If the First Fleet piano could talk, it might tell you about its eight-month adventure across the seas from England to Australia, where it arrived as the then-new colony's first piano in 1788. The finely crafted instrument then might go on about the pair of fires it survived, or about how it became the first piano used in lessons in Australia. Our talking piano could undoubtedly tell you about the pains of aging as well. Historical instruments contain moving parts, ornate inlays, and ivory keys that can disintegrate over the centuries, and are often very hard to replace. Wood rots. Delicate mechanisms can rust or splinter. Sometimes, instruments suffer neglect to the point where they cannot be saved. 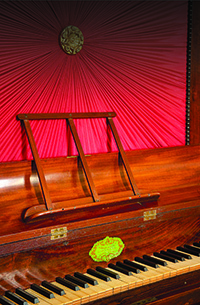 So, when Stewart Symonds, a Sydney collector, began looking for a long-term home for the First Fleet piano and 139 other vintage keyboard specimens he owned, he was lucky enough to encounter a kindred spirit — one who is not only an international-award winning fortepianist and educator, but also has an abiding interest in the conservation of historic keyboard instruments. That kindred spirit, Professor Geoffrey Lancaster, happened to be a research professor at Edith Cowan University. Shortly after joining the university in 2015, he alerted ECU to the cultural heritage value of Symonds's collection and suggested the university acquire it. "Several of the instruments are unique to the world, often by virtue of the fact that they are the only remaining examples of the work of particular makers," Professor Lancaster said. "Or they are rare, or of Australian cultural significance." Lancaster's interest transcended merely curating the vintage keyboards. Indeed, he wanted the university to exhibit the collection — now part of a larger group of donated keyboards called "Founding Pianos." But he also wanted it to spearhead a program devoted to conserving and/or restoring much of what Symonds spent half a century amassing. What's more, Professor Lancaster saw the opportunity to train a new generation in how to do the work. As fortepianos (the precursors to the pianoforte — or what are simply called "pianos" today) and other keyboards of the era most often linked to composers such as Beethoven, Chopin, Mozart, and Schubert continue to grow older, their maintenance has become a pressing issue. Because many are deteriorating from time, disuse, and neglect, the sounds they make are threatened with extinction. According to Lancaster, who has recorded more than 50 commercially released CDs and is known as one of the world's most accomplished performers on late eighteenth- and early nineteenth-century fortepianos, this is a potential tragedy. "Playing on such instruments is akin to travelling in time," he said. Nearly 50 years ago as an undergraduate piano student, Professor Lancaster became enchanted by an early nineteenth-century fortepiano he spotted in a Sydney antiques shop. The shop owner had a passion for the dozens of old instruments he displayed there — something Professor Lancaster intuitively understood. "Within a very short space of time, that antiques dealer changed my musical life," he said. "I knew in my spirit that this is what I should devote my life to." In 2016, after several major Australian institutions had turned down Mr Symonds's offer to donate his collection, Edith Cowan University bought into Professor Lancaster's passion and trucked the collection across the continent to Perth. Now on campus, the Founding Pianos collection features instruments made from 1736 to 1874, among them the Frederick Beck square piano that came across the oceans on the Sirius with Australia's original settlers on the First Fleet. The collection has been recognised as one of the world's most significant, rivaling those found in Austria, France, Germany, the United Kingdom, and the United States. What distinguishes the collection is its importance to Australian musical history — and the role ECU plays in keeping many of the collection's instruments in working condition. "The Symonds Collection is the only such collection at a public institution that has made many of the collection's instruments available for applied research and training in the techniques of conservation, restoration, and maintenance," Professor Lancaster said. As a result of his vision and Mr Symonds's generosity, Edith Cowan University is now at the centre of worldwide efforts to develop best practices and educational programs on how to painstakingly conserve and restore prized historical instruments. As the university ramps up its research efforts in many academic realms, the Founding Pianos restoration program comes at just the right time, Professor Lancaster said. Too few people worldwide are involved in conserving, restoring and maintaining old keyboards, and fewer still are being groomed to replace them. In taking on the challenge of reversing those trends, Edith Cowan University hopes to become a world leader in codifying and researching ways to keep many instruments playable, while conserving those whose operational days are past or that are so valuable as sources of information that they should not be touched. The goal is to develop Australian expertise that rivals that of other Western nations. Yet, the knowledge the program gathers won't be limited to Australia. Edith Cowan University has joined a network of august music institutions — including the Royal College of Music in London and the Paris Conservatoire — that feature considerable collections of historical instruments. The university will share its findings and restoration techniques. Professor Lancaster, citing 40 million piano players in China, believes the research program's reach could one day become wider and much more profound. With the help of conservators, technicians, and engineers — including several Edith Cowan University faculty members and staffers — researchers will investigate several obstacles to restoration. Those include repairing or replicating parts made from ivory or whale baleen, both now protected by worldwide conservation efforts. The University plans to link students with master restorers who will teach them the finer points of the trade. This year, it will begin the world's first PhD program devoted to keyboard instrument restoration, which will research and document current methods of maintaining the instruments' vitality. One of the first steps in the program involves evaluating the needs of each instrument. During this year, a PhD fellow will observe and document this process, as well as the actual restoration of the First Fleet piano, which will make a return voyage to England, where accomplished restorers will rehab it. Besides raising the profile of Edith Cowan's Western Australia Academy of Performing Arts (WAAPA) and its reputation as a pre-eminent institution for music study in the region, the focus on historical instruments will enable students to learn to play on instruments that in some ways resemble the modern piano, but make sounds that are distinctly different. "In relation to musical art, it has to do with the deepest levels of meaning," Professor Lancaster said. "ECU's hope is that the lives of students, music lovers, scholars, visitors to Western Australia and members of the broader Australian community will be transformed by the beauty of the sound of the instruments in the collection," he said. "For this to happen, some instruments need to work."